Gerry Johnston spoke with Real Madrid fan, @TheRMFan about the season ahead in the latest of our Fans View Series. Real Madrid won La Liga and the Champions League last season. How important was it for the club to win the league title after a few years without winning it? One resonates Champions League with Real Madrid – the hunger, the desire, the sheer determination that goes with it is unmatched by another club. But then winning the league is extremely important too. On two fronts: to take away the authority that Barcelona had over the league and more importantly, highlight that the club did well over a period of nine-ten months and earned the league title. Zinedine Zidane has been pretty much flawless since taking over from Rafa Benitez. How highly do you rate him as a coach? Extremely highly. He didn’t have the greatest impact when he was the Real Madrid Castilla manager but ever since he took over from Rafa Benitez, he has had a massive impact. It is visible on the field, in his decision making and it has, deservedly, been appreciated by those at the Bernabeu in giving him control over who comes in and who goes out – not an easy thing to manage at a club like Real Madrid. What do you make of the clubs transfer business both in and out this summer? It has been interesting thus far. While the idea suggested by Florentino Perez following the double was to make minimum changes, I believe the changes have been quite significant. The asset for the club last season was in the ability to rotate the players and having enough quality on the bench to win games in the latter stages of the league. And it is worth that remembering that the club would be playing UEFA Super Cup, Super Copa de Espana, Club World Cup, La Liga, Copa del Rey and the Champions League – six trophies. I like that the club has been clever in investing in the youth but at the same time, some of the youth that did come through the club ranks has been let go of which is disappointing to see. With the exit of Danilo to Manchester City – for a neat sum, if I might add – the right back position is once again short staffed. Dani Carvajal more than makes up for the position but it may be wise to bring in a replacement instead of the expected decision to play Nacho Fernandez there if and when required. I wouldn’t say it is a realistic signing but I would say it is an inevitable signing. The club are likely to go after Kylian Mbappe – be it this season or the next. Logical reasoning would say go for it now while you’re in the surplus following the player exits. Additionally, if the Monaco player has another great season, his value would only get higher. Is there anyone in the squad that you are concerned might be tempted to move away from Real Madrid? Quite honestly, I think the business by the club – as far as the selling is concerned – is done. But if I were to venture with a guess, I’d say Lucas Vazquez is one who could ask to move away considering he isn’t a starter for the club and given his quality on the wing, he should be one. But again, the chances look slim as he should be happy with the impact substitute role. 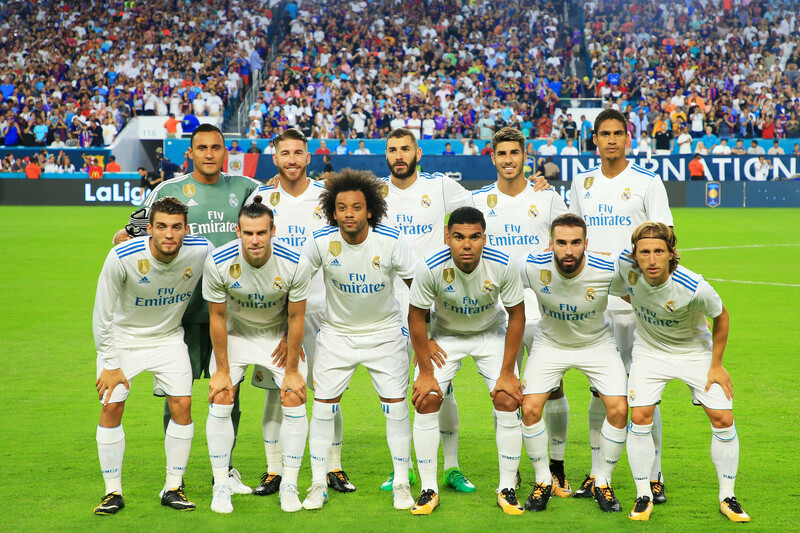 Considering the commitments starting early with the UEFA Super Cup against Manchester United and then the Supercopa de España, Real Madrid have kept their pre-season down to four games in the United States. Started off with a 1-1 draw (and loss on penalties) against Manchester United and it is followed up by games against Manchester City, Barcelona and MLS All-Stars. Honestly, no. I expected Mariano Diaz to stay and look for a place but his decision to move to Lyon is understandable. As a centre forward, it was nearly impossible for him to find any playing team. Heck, if Alvaro Morata didn’t, he was further down the order. What are Real’s targets for next season? As is always the case, go for it all! ???? But quite seriously, Copa del Rey is never priority and everyone knows that. The other five trophies would push players, Zidane and the staff all the way. Even the newly appointed medical team! Fulham and Felix- The Perfect Match?